Husky Liners Mud Guards - Kick Back - Dezod Motorsports Inc - Home of the automotive performance enthusiast since 2002. When you have a monster of a truck, you need a monster of a Mud Flap. 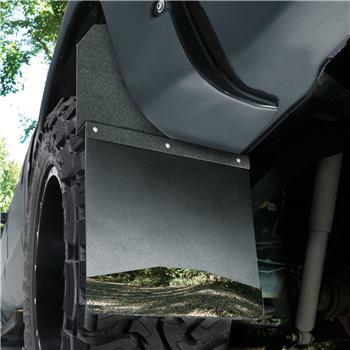 Our Kick Back Mud Flaps have an 18 gauge steel bracket that sets the mud flap back to make room for your insanely huge tires—giving you extreme protection and clearance. Fashioned from our durable AntiSpray material and your choice of 14 gauge laser-cut Stainless Steel or Textured Black Matte finish, the easy to install Kick Backs will protect your beast from the rage of the road.